Ooh how exciting. 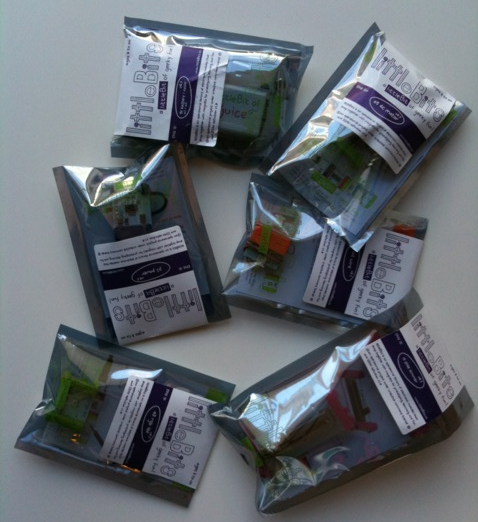 Our littleBits set has just arrived. littleBits is a range of modular electronics components for kids from age 8+. You simply snap the component together magnetically to create circuits with power, inputs and outputs. There are lots of excellent electronics kits that teach kids about electronics. But littleBits is different. It's designed for making things that do stuff. We're a maker family. We have a Silhouette Cameo craft cutter, a 3D printer, a CNC machine (under development) and we like to make stuff. We also have lots of home automation. The boys adore LEGO and junk crafts and are always building something or other. I wanted to find something that we could use to add electronics to our kids projects so we can have flashing lights, movement, sound, etc. littleBits is quite expensive, but it is very kid-friendly and hopefully we'll be able to have more fun and less frustration. We'll get them going with breadboard electronics when they're a bit bigger (and get them watching sooner.) But littleBits looks like a good first step. There are loads of different littleBits input and output components and a choice of options for powering your contraptions. You just snap them together to make circuits and the components are very much intended for making things with rather than just learning the theory of electronic. My 6 year old likes the idea of adding lights to his Playmobil pyramid and using a motor to build something that will automatically knock the walls out of it. I don't think they'll have much trouble coming up with ideas for things to build and automate. I'll update when we've had chance to try out some projects.